Dana Wood is a talented writer with bags of experience working at well-known magazines and beauty brands such as Glamour, InStyle and Brides. When she contacted me to work with her on creating her own brand and website, I was thrilled because I'd get to flex my design skills in creating an online showcase that would help her make the leap back into the world of being self-employed. Having made the leap myself 8 years ago, I love helping others find fulfilment by creating their own path. Dana wanted a calming, minimalist brand and website that would allow her work to shine without distraction - and she's carried that brand through into her offline materials, as well. We also adapted the Forte Squarespace gallery function to create a horizontal slideshow of her best work. Have a look here for yourself: visit Dana Wood's writing website. Amanda Dudman has been working with executives and Boards to help them maximise their potential, and that's kinda what we did with her website. Amanda already had a website but it just wasn't positioning her in the right way to appeal to senior executives, nor was it imparting the positive, warm and uplifting feeling that she wanted people to experience (a reflection of the feeling they get when working with her). I took inspiration from her logo, which is based on sunshine, and used that as the unifying thread for the imagery used on the website. In addition to the usual design, build and training, I also conducted image research and content consultancy for the site, as well as doing a business portrait photo shoot to so that her profile photo matched the website. Amanda was also keen to start blogging to give potential and existing clients a window into her world, and also to help build her reputation as an expert in coaching and training. I'm pleased to see that Amanda has taken to blogging like a duck to water, regularly posting and putting us lazy bloggers (yes, that's me!) to shame. Check out Amanda Dudman's coaching website. I first started working with Helen Clements many moons ago, when we built the website for her business on the old Squarespace 5 platform. The site was pretty forward-thinking back then, but things have moved on, and so has Helen's company: Where There's Smoke. The business had expanded, undergone a brand refresh, and now it was time to refresh the website to take advantage of some more innovative design approaches, such as parallax scrolling and mobile-friendly responsive design - both of which come as standard in Squarespace 7. After all, if your company is all about innovation and creative ideas, then your website better deliver on those concepts, too. 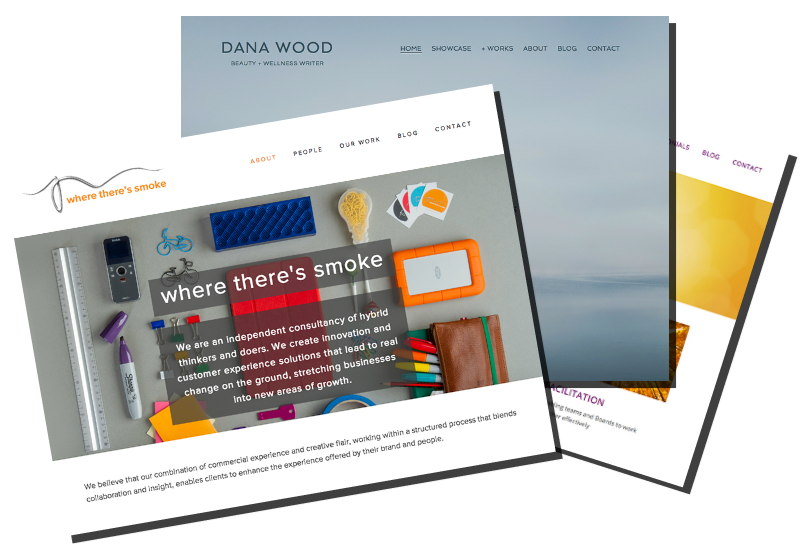 Working with Helen and her business partner David, we took a concept from her old website and expanded on it: the idea is that unlike other business consultancies, Where There's Smoke has a hands-on, sleeves-rolled-up, maker & do-er approach to their work. We took this concept through all the lead imagery on the site, and even did a photo shoot of some of the actual materials they use in their workshops to make the site truly tailored to them. I love the results, and so did they... in fact, they've now put the key imagery on their business cards and stickers. View the fruits of our labour here: pop over to the Where There's Smoke consultancy website.